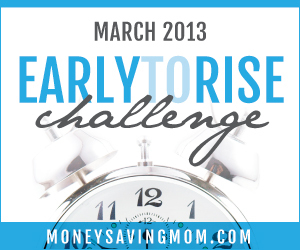 This is Day 19 of the Money Saving Mom Early To Rise Challenge! Today's passage talked about one of my favorite words. Planning! We don't just stumble through our day, (or our life, really) waiting for something to happen to us. 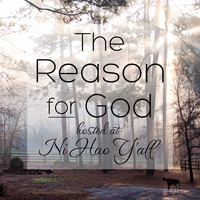 If we do we have a victim mentality. The author explains this more in depth in the book. But first, we need to back up and do something to take control of our day, and that would be planning! 5:00 pm: Start preparing dinner if it's not already in the crockpot. 6:30 pm: Hubby home (hopefully), dinner time! 8:30 pm: Kids get ready for bed, spend some one on one time with the baby. Wind down with hubby. 10:00 pm Baby down for the night. Read a little, then bed time. Now that I know what my day looks like, I can take control of it more instead of stumbling through and hoping something somewhere gets accomplished. This also allows me to have more goals and be more effective in getting them done. I'm going to tell my time what to do today! What does your schedule look like? Do you like planning or do you prefer living in the moment?